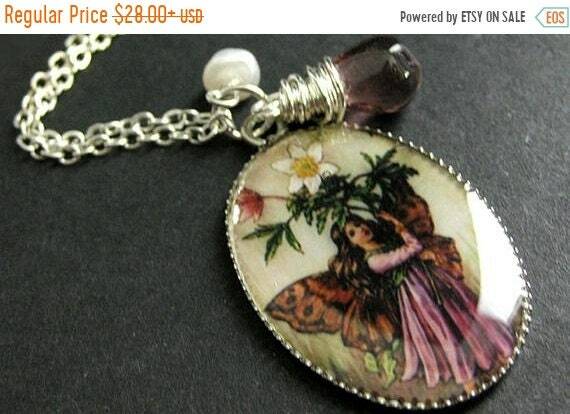 EASTER SALE Flower Fairy Necklace. Amethyst Fairy Pendant with Purple Teardrop and Fresh Water Pearl. Fairy Jewelry. Handmade Jewellery. A clear amethyst glass teardrop and fresh water pearl charm have been combined with an 18x25mm handmade pendant with a picture of a pretty little purple fairy in this handmade flower fairy necklace. If you would like a length of chain different than offered, please contact me for pricing. EASTER SALE Fairy Charm Necklace. Bronze Faery Necklace with Pink Teardrop and Fresh Water Pearl. Handmade Jewelry. EASTER SALE Purple Eiffel Tower Necklace with Frosted Purple Teardrop and Fresh Water Pearl. Paris Necklace. Handmade Jewellery. Purple Bird Necklace. Lovebirds Necklace with Purple Teardrop and Fresh Water Pearl. Handmade Jewelry. EASTER SALE Pink Dragonfly Necklace. Dragonfly Pendant Necklace in Bronze with Pink Teardrop and Fresh Water Pearl. Handmade Jewelry. EASTER SALE Owl Necklace. Bronze Owl Locket Necklace with Glass Teardrop and Fresh Water Pearl. Handmade Jewelry. EASTER SALE Bronze Leaf Necklace. Fern Leaf Necklace with Clouded Green Teardrop and Fresh Water Pearl. Handmade Jewelry. Black Heart Necklace. Black Glass Heart Necklace with Wire Wrapped Red Teardrop and Fresh Water Pearl. Goth Necklace. Handmade Jewelry. EASTER SALE Blue Dragonfly Necklace. Charm Necklace with Dark Blue Teardrop and Fresh Water Pearl. Handmade Jewelry. EASTER SALE Capricorn Astrology Necklace. Zodiac Necklace with Glass Teardrop and Fresh Water Pearl. Capricorn Horoscope Necklace. EASTER SALE Bird Locket Necklace. Crane Necklace with Pink Teardrop and Fresh Water Pearl. Heron Necklace. Handmade Jewelry.